Lemon GreenTea: Are you ready to fight germs with the Hygienix Shower Rangers? Are you ready to fight germs with the Hygienix Shower Rangers? 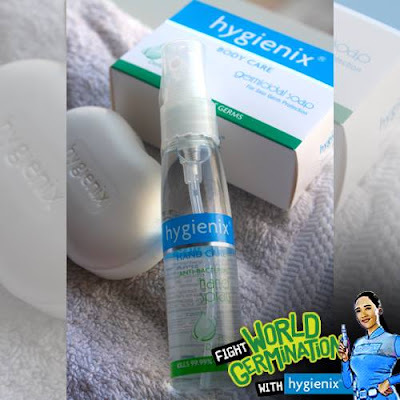 Join #Hygienix in its #FightWorldGermination Campaign. Oh no! The #Germperor has sent the most vicious #Germdugo to terrorize humans by spreading germs, unpleasant odors and sickness. But fear not! The Hygienix Shower Rangers are here to the rescue! Each Shower Ranger is armed with a special weapon to make bath time with Hygienix Germicidal Soap fun yet effective for the entire family! Hygienix is a complete system of antibacterial products so you can #FightWorldGermination wherever you are! Hygienix Germicidal Soap kills 99.99% of germs and common disease-causing bacteria while moisturizing skin. Hygienix 65% Ethyl Alcohol effectively kills germs and disinfects but doesn’t dry skin. Hygienix Anti-Bacterial Hand Gel and Hygienix Anti-Bacterial Hand Spray sanitize while keeping hands smooth and soft. Get Hygienix antibacterial products from major supermarkets, drugstores and groceries nationwide including Puregold, Robinsons Supermarket, Mercury Drug, SM Supermarket, Super 8 and many more.